Today is International Women’s Day. I was searching in a box for something from high school and didn’t find it. I did, however, find a piece of paper that is nearly 40 years old. This paper is the transcript of the blessing my father gave me when I was not quite two months old. A traditional baby blessing as a member of The Church of Jesus Christ of Latter-day Saints is given by the father to an infant son or daughter for two reasons: to give the baby a name, and to give a blessing both spiritual and physical in nature. During the blessing he gave me, my father focused on three women from whom I could learn from their wisdom, counsel and example. Those are some big dreams for an infant. Growing up with these three women, I was constantly around their examples of hard work, education, sacrifice, and humor. Grumma’s laugh is infectious. Grandma DeeDee is witty and wise. And Granmere (my mom) fills a room with hilarity when she has one of her giggle fits. You can still be silly even when you’re talented, professional and smart. That’s what I learned from all three. Lucky me to grow up with strong women. 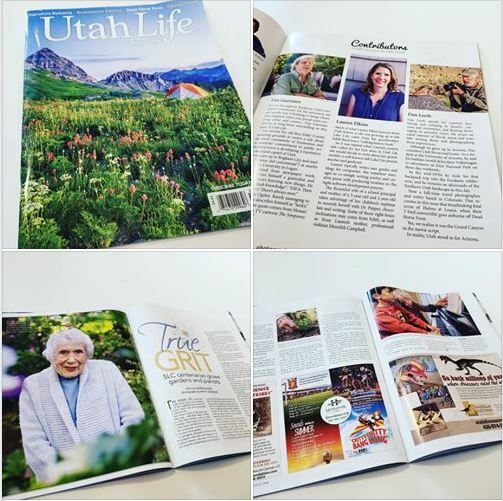 Pick up a copy of the July/August edition of Utah Life Magazine and you’ll find me, my Grandma DeeDee, and my son, Dominic. I’ve pitched and submitted plenty of stories and pieces over the last several years. I’ve received oodles of “no thank yous” and non-responses. One evening, I sent in a pitch to this Utah Life and afterward, I thought: I should have polished that idea before submitting it. If you search the web, you’ll find lots of articles giving advice about what it takes to create a successful pitch. I know. You have to stand out in some way. A few days later, the editor emailed me about it. He wanted it! What was my pitch? 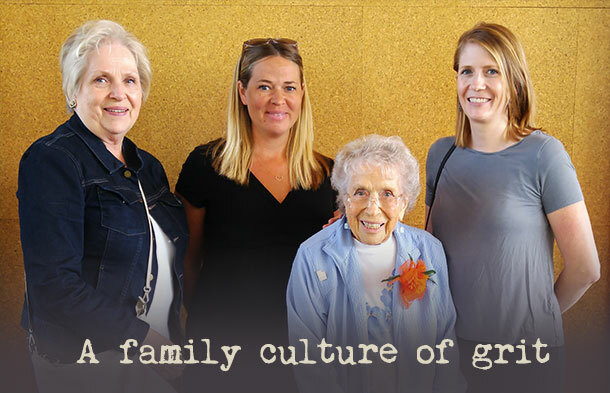 A story about the legacy of one of my grandmothers, specifically my grandmother, Edith, who is 100 years old, teaches my son piano (plus 19 other students each week), continues to work hard in her beautiful garden, and has left an impact in the lives of thousands of piano students. Many of the work I do now as a writer is to meet somebody else’s needs. I write social media posts about finding a software development company. I write blog posts about using a VPN on the free wi-fi at the gym. I write website content for some of the projects with the LDS Church. I don’t write about things that I love, necessarily. Writing this article was daunting because I wanted to create a personal masterpiece. Talk about pressure, huh? It took several drafts until I sent in the story. I was rejected. But, this rejection was different. I was rejected with an offer to review things over the phone with the editor. “You bet,” I replied back. With the feedback from that phone call, I started over, working a new story. It felt a little bit like how it must be to piece together a quilt, taking sections at a time, then bringing them together, stepping back and appreciating the whole. I sent my new story in. It was a few months after submitting it until the print magazine arrived in the mail. Since then, I purchased several more copies from Barnes & Noble and found that they also carry it at grocery stories, drugstores, Costco, and Sam’s Club (in Utah). You can also order a copy from their website. Will you read my story? Will you send a letter to the editor about it (editor@utahlifemag.com)? If you know of past student’s of my grandmother, will you tell them about it? If they send in letters to the editor and they print those up in the fall issue, I will take a copy over to her and we’ll read them together. That would be an awesome afternoon, in my opinion! Will somebody drive to Kamas and buy me some donuts? I wrote this as an attempt to get a job with a magazine as their humor columnist. I didn’t get the job. It was good times trying, though. Now, you can hear my story. It’s from last summer, up in Park City, so I get to include the video Google made for me from my cell phone media. Enjoy. I couldn’t be interrupted. Not for a poopy diaper. Not for fighting kids. Not for spilled milk. Not for a few minutes. I was on Instagram. You can’t be interrupted when doing that. If you look away for a few seconds, it races you back to the top of your feed. Who designed that user experience? While my two kiddos bickered and argued about who got to help Daniel Tiger go potty on the Kindle game, I double-tapped on all of my friends’ pictures of their kids. Like. Like. Like. And then this delectable picture slid up into my view. Oh. My. Donuts! I was hungry. Dinner waited for me to put down my phone and begin assembling a Pinterest-inspired Instant Pot Martha Stewart or Paula Deen or Anthony Bourdain or Lion House rolls copycat recipe. The fritter filled more than half of the donut box. Yeah. I could eat that for dinner. I had to go. I clicked on the location tagged in the picture. These are REALLY from a Chevron? I could get some donuts with my Techron? I scanned over the comments on the post and made note of several important details: one person said they went and the donuts were sold out; the fritters are as big as a dinner plate; the locals want to keep it a secret. Do you ever fall victim to the mistake of browsing social media when hungry? I am an accomplished dessert-pinner between the hours of 3:00 and 5:00 in the afternoon. The location of the donuts was problematic for me. It wasn’t because it was at a Chevron. I’m what you might call a Chevron fan girl. I know. You didn’t think that was a thing. It is. I’m one. My mom is one. It’s that Techron, you see. According to my wise mother: a reputable consumer product ratings magazine declared that Techron was a legit additive that truly did clean your engine when you used it. I often passed gas station after gas station to arrive at a particular Chevron, whip out my blue gas card, and fill ‘er up. The problem for me was that the Chevron was located in Kamas. Trusty ol’ Google maps informed me that it was a 59 minute drive to purchase the sugary goodness of those small-meteor-sized fritters. For some people, an hour in the car is their typical one-way commute. I was once one of those people. Now, an hour in the car means trouble because my world revolves around the sacred nap. Don’t interrupt my toddler’s nap. Do you want to know the last people to knock on my front door during nap time? Jehovah’s Witnesses. I decided to make the donut trek late in the afternoon after a day at the lake. Donuts post swimming and boating sounds like the best way to refuel. And I could do it while simultaneously fueling my SUV with Techron. Everyone wins. I was with family at Rockport Reservoir, which, by the way, is a hidden gem on the Weber River, named after the town of Rockport: a town it completely submerged when it was created by the Wanship Dam. (Insert bad joke about being underwater on your mortgage here.) Shortly after lunch on the beach, I loaded up my four-year old and one-year old in my soon-to-need-gas SUV. We took a scenic drive to get there, traveling along Highway 32, through Peoa and Oakley before rolling into Kamas. My toddler fell asleep at the beginning of the drive. “There it is, mom,” son announced, pointing not at the distant Chevron we were approaching, but at the red dot on the Google Maps app on my phone. It was 3:00 in the afternoon. Could there be any donuts left? We filled the car with Techron, then went inside for donuts. I looked around for the donut case. They didn’t have a case. A donut-display wall: four doors of five shelves with trays filled with donuts, bars, fritters, bagels, and brownies. At 3:00 in the afternoon on a Wednesday, only a few brownies remained. Not even a plain ol’ glazed donut. “Where are the donuts, mom?” my son asked. I told him I was sorry. I was sorry for myself. I felt tricked. I’d been caught by a social media phishing scam! I’d seen pictures of donuts. Delicious donuts. Giant donuts. Calories-for-days donuts. Maybe they HAD been a trick! A gimmick! A carefully crafted hook to convince me to drive to the small town, nestled in a nook of the Uinta Mountains. Once there, I’d bought their Techron gas. And I’d used precious nap time to drive there! It was a long, quiet drive back, without anything frosted in maple. Without anything that rhymes with twitter. Maybe I should stick to thumbing through Twitter before dinner time anyway. I have yet to get swept up in a futile mission to buy donuts while reading through Tweets. The culture of the Carlquists is grit. Carl Arvid Carlquist was born in Sweden in 1857. He moved to Utah, raised his family here, had a son, Carl, who had a daughter, Edith, and she is my Grandma DeeDee. Or be born into it. 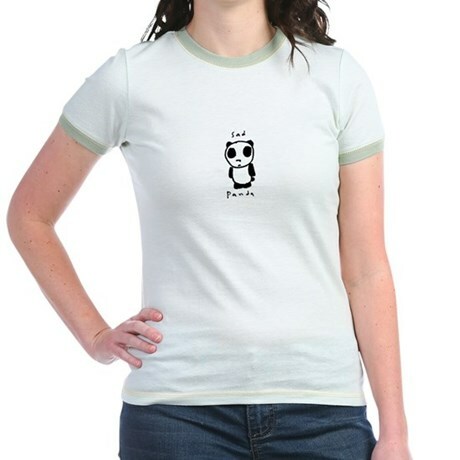 I was born into the gritty, Carlquist culture. It’s about the team you are on. Duckworth explained further in her book that excelling athletes need talent, hours, and correct practicing to become the best. But they also needed one more thing: they needed to be on a great team. I tried out for my first competition soccer team when I was in elementary school. I think most of the girls there made the team. It wasn’t very hard to be a girl playing soccer in the late ’80s. I remember my freshman basketball tryouts and how we were running drills and it was packed, getting all of those girls, hoping for maybe 20 spots on the team, to line up together and start sprinting up and down the court. The coach had a lot of people to cut. Great teams have tryouts. They cut people that won’t excel in their culture. And the great players that make it, are what make the team great. She’s 99. She has about 20 piano students each week. She puts in hour after hour of hard work in her garden each week. She plays the piano for the children in church. She does the crossword. She hosted a dinner with friends at her home recently and made several wreaths and decorations from flowers she’d picked from her garden and carefully dried. She’s doing all this while she’s going blind and has lost much of her hearing. And she feels crippled by arthritis. She wants to have more grit. She exudes grit. I have grown up around her and the Carlquist culture. It’s the grittiest. I have heard family stories of grit and witnessed it myself. Have a growth mindset. This one is included in Duckworth’s TED talk and it “is the belief that the ability to learn is not fixed… can change with your effort.” Failure doesn’t stop you. Grandma DeeDee calls her backyard the garden of her mistakes. I told her, once, that I’ve had a lot of failures figuring out how to garden. She laughed. She has failures every year. “That plant just doesn’t like that spot,” she said. “So you move it or you pull it out and throw the dead thing away.” You do something different next time. Pursue your passion. Lots of things I’ve read online have impressed on me that having grit doesn’t just mean that you’re tough. It means that you push through and hold true to your end goal. So you have to have an end goal to begin with. And then, you need to have the passion to get there if you’re going to overcome the potholes on the way. Grandma didn’t marry young. She finished her degree at the University of Utah and went on to Columbia Teacher’s College for her master’s. She lived in New York then went to San Francisco to serve an LDS mission. When she did marry, she was passionate about raising a family, fighting through eight pregnancies where she was sick the entire time. I have had two pregnancies, sick the entire time through both, and it felt eternal to me. With both pregnancies, I reached a point where I hit a wall of depression and unfounded realization that I would feel like this for the rest of my life. I couldn’t convince myself that it was temporary even though I knew it would be gone once the baby was born. I could never imagine doing that eight times. Grandma was passionate about having children. 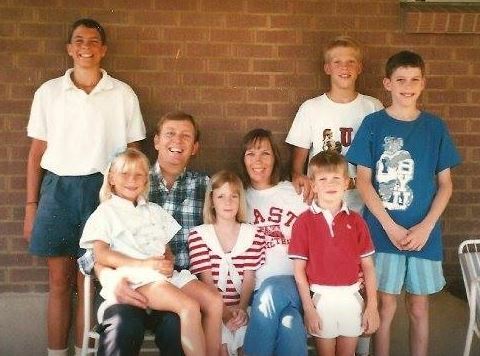 She pursued it and raised bright, talented, loving, and gritty kids. Authenticity matters. This is the part that brings me to my #yearofbeautiful initiative. How can I live more authentically? How does this tie to grit? Well, let’s imagine that you’re pursuing a goal and you’re determined to stick with it, no matter what. Because grit. But, as you get further along, you realize that your goal does not align with your inner values. Do you then keep your rigid determination to follow through? Do you ignore at what cost you must do that? That doesn’t sound fulfilling for me and I’ve found an article that lists many studies that found that it matters MORE if you can be both persistent, and authentic when creating your goals. From that article, they defined a three-part measure for authenticity: living in accordance with your values and beliefs; staying in touch with the ‘real you’; and not feeling the need to always do what others expect of you. My Grandaddy was in a hospital when my Grandma was younger and taking care of her little kids. He was in a hospital for mental instabilities. And he wasn’t getting out. So Grandma went down there and brought him home, determined to help him and take care of him, in addition to caring for her own small kids and her two step kids. She didn’t care what others thought about her going and doing this. She wanted her husband around. And she believed that she could help and take care of him. And she did. He got better. They worked hard. They raised their family. This story is authentic. Understanding both grit and authenticity feels like understanding the entirety of an iceberg to me. I have a glimpse of the surface. I haven’t even walked on it yet, let alone, been beneath the icy waters to see the full size of it. Tell me, please: have you found podcasts, blogs, books, or TED talks that have given you more insight into both grit and authenticity? What are they? Part of my #yearofbeautiful is to strengthen my connection with others. I’ve been thinking today about my connections within my own family and came across this article from The New York Times: “The Stories that Bind Us”. Here’s the bathroom break version of the article: If you want to create strong, lasting family relationships, develop a strong, lasting family narrative. That was a short bathroom break. What IS a family narrative and how do you create it? Family strain could create dark narratives: money, arguments, name calling, loss, etc. Maybe your family strain is because you made jokes about how long it takes somebody to poop and you posted it for all of the internet to read. Seriously. That’s rude. Don’t do that. Keep poop time-frames personal, people. I read something in a Reader’s Digest years ago. I was sitting in the bathroom but I won’t tell you WHAT I was doing or for HOW long. Let’s just say that what I read was a simple, short paragraph about how kids are more resilient when they know the story of their family. My memory instantly took me to the basement of my Grumma Campbell’s house where the walls were brown and wood, the carpet was dark, the couches lining the walls also dark, and we were crowded down there with cousins, aunts, and uncles, listening to Grumma tell the history of one of our ancestors. I hope it was either Aquila Nebeker or Christopher Columbus Kearl. They have such great names. Is that part of my family narrative? Where I come from? Men like Aquila and Christopher? And does it matter that I don’t know the stories of my husband’s ancestors? Or even their names, really? Do you know where your mom and dad went to high school? Do you know where your parents met? Do you know an illness or something really terrible that happened in your family? I wonder: can my four-year old answer any of these questions? I asked him. How do you teach your kid to have a strong “intergenerational self”? And if you’ve done #3, I want to know what it is! Two minutes that mattered for me today. Sometimes, people just want to help out. I know. It’s not poetic. It’s not quotable. You might not even remember it tomorrow, but hear me out. Today, I was going to try and take my kids to Wheeler Farm with friends and cousins, but one sick little cousin canceled plans. At about the same time as the text about that, a neighbor texted me, offering to watch my kids. She offered so I could go and visit my Grumma in the hospital. I took her up on it. It’s hard to ask for help. It’s hard to accept help. I relate it to the story of Naomi and Ruth. After Naomi was widowed and her sons had also died, she pushed her daughters-in-law away. She tried to send them back to be with their own mothers. She pushed them away, in a time of loneliness and a time of great need as it was during a drought and famine. But Ruth pushed back and told her she wouldn’t leave her. I am Naomi. I push away people willing to help. I am not entirely sure why I do this. Any suggestions? Perhaps I don’t want to feel obligated. Perhaps I feel like I owe them money or something. Perhaps I want to do everything on my own. This morning, I accepted the help. This same friend made a comment, months and months ago, about how sometimes, the only thing a person helping out needs is a thank you. Her point was that when we try to “make things even”, we cheapen the service. Do you often help or serve because you want to provide the support? Maybe you don’t even want the recognition because that puts a spotlight on you. You just want to help. Without repayment. Without recognition. Without fanfare. A simple “thank you” would suffice. Today, I accepted the help. It was a lot of help. She watched both kids all morning. I spent time visiting briefly (two minutes) with Grumma before she had a second surgery on her heart after suffering a massive attack this week. I was there minutes before she was taken out of her room and into surgery. I couldn’t have visited with my kids as they don’t allow them in the cardiac ICU. My neighbor also kept Dom for much of the afternoon so I could spend Gabbi’s nap getting writing done for an upcoming content deadline. And then do you know what else she did? She tossed a few pantry items my way so I didn’t have to go to the store today to come up with a complete dinner. I said thank you. I said it a few times. And then we walked home in the spring sunshine. I read a lot of things about raising children: books, blogs, articles, forums, scriptures, and on and on. Like I’ve previously mentioned, being a parent is daunting and pretty much impossible. We are all doing our very best and all imperfect. Recently, I’ve been reading the book, Peaceful Parent, Happy Kids: How to Stop Yelling and Start Connecting. Have you read it? What did you think? I’m still in the process. Today, I read this article: Want to Raise a Trail-Blazing Daughter? ‘The Notorious RBG’ Says Do These 7 Things. I thought I’d check it out and see what the list was like, whether it applied to my daughter (and my son, too), and whether I wanted it to apply. Foster a love of reading. Absolutely. We know this. We know about the huge impact of early childhood development and how much that sets your kids (sons or daughters) up for success. I loved reading. I know not all of my siblings did and I remember hiding in my closet to read because I thought my brothers might tease me about it. I want my kids to love reading, too. So far, they do. But having a love for your favorite book about trains is different than sneaking away to read The Screwtape Letters. Teach them to be independent. My four-year old can dress himself, make his own snack of melted-cheese Ritz crackers, and manage himself in the bathroom. (Is that the most polite way to put that? I’m always so polite. Especially on the internet.) My one-year old can walk. So she’s got that going for her. This took me years and years to learn. I wanted so bad to be in the popular group of friends in high school. I look back now and wonder, who really was the popular group? The football players? The cheerleaders? The school president? The choir president? Why did I care? Eventually, I learned that it matters more how you treat others than it does how many party invitations you get. And I think this is something that parents have to kind of get out of the way and let kids figure out, eventually. Encourage them to seek out great teachers. When I would tell people I was getting an English degree, 92.6% then asked me if I was doing that to be a teacher. No. Certainly not. Why? Because I knew I couldn’t be the kind of teacher that my great teachers had been for me. I had great teachers, both in school, in sports, in church, at work, and in friends. I wrote previously about how I hope that my children find great teachers as well. Encourage them to turn a deaf ear when needed. To quote Ginsburg here, “When a thoughtless or unkind word is spoken, best tune out. Reacting in anger or annoyance will not advance one’s ability to persuade.” One of my great teachers, my Grandma DeeDee, is the first example I can think of that lived her life like this. Here’s one I can definitely work on myself! And maybe if I tell my kiddos about how I am working on it and when I succeed or fail, they will learn from my example. Encourage them to set aside their worries—and simply achieve. I remember sitting down in the office of an English professor when I was on academic probation. She found out that the both of us were taking the same meds to treat depression. I was STUNNED. Why? Because successful moms with loving husbands, four grown boys, a successful career as a professor, and award-winning books, didn’t have depression. You can’t be depressed and succeed. She helped teach me not to listen to THAT voice in my head. What a lesson to learn. Now, if only I can think of a way to pass this lesson on! Pray that they marry the right person. This was the most surprising item on her list. Did it surprise you? Did you know that Ginsburg’s husband did all of the cooking? Excellent! I hope that my kids learn this simply by watching me and Nathan. We are two very different people and, yes, that causes conflict. But I hope that it complements more often and I hope that they see that. I hope that they think of their mom and dad as a team loving and supporting each other. Nathan supports me in a ton of ways, most importantly in helping me to continue to take care of me so I can be a whole person and the mom that my kids need and deserve. What’s your favorite item on the list?